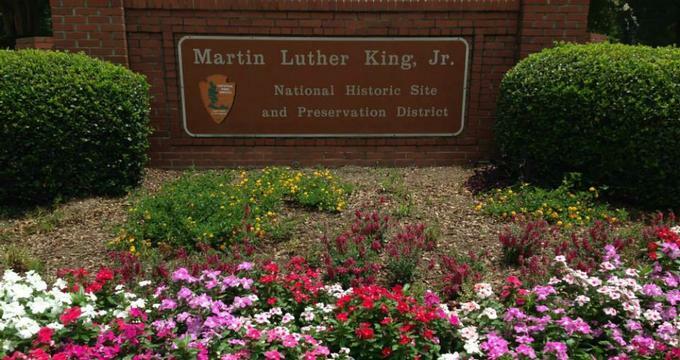 The Martin Luther King, Jr. National Historic Site in Atlanta, GA was established in 1980. It includes several different buildings, such as the original Ebenezer Baptist Church and the birth home of Martin Luther King, Jr. Other locations serve as a reminder and commemoration of the life and works of the civil rights leader. The national historic site's Visitor Center houses the D.R.E.A.M Gallery which plays hosts to special changing exhibits, as well as video programs. In the center's lobby is "Children of Courage," an exhibit designed for younger visitors that tells how children participated in the Civil Rights Movement and challenges youth today to have the courage to stand up for what's right. Visitors can also join marchers as they journey up "Freedom Road." Dr. Martin Luther King, Jr's birth home was a Queen Anne style house that was built in 1895. In 1909, the home was bought by Reverend Adam Daniel Williams, a pastor of Ebenezer Baptist Church. His daughter, Christine, married Martin Luther King at the church in 1926. Her husband moved into her family's home, where Martin Luther King, Jr. Was born. After Williams died in 1931, the Kings moved to a new home, however, the house remained in the family. Plans began in 1968 to turn the house into a historic museum after Dr. King's assassination. The free Birth Home Tours explore the interior of the house, and are offered to a maximum of fifteen people. These tours are led by a ranger, and are spots on the tour are available on a first-come, first-serve basis. The Martin Luther King, Jr. "I Have a Dream" World Peace Rose Garden at the Martin Luther King, Jr. National Historic Site was planted in 1992 as part of the International World Peace Rose Gardens program. This program was created to help youth around the world recognize the value and importance of peace. The garden is an artistic interpretation of the ideals of peace through nonviolence. There are 185 roses with an array of fragrances and colors. This rose garden in Atlanta is one of the world's five major World Peace Rose Gardens. Ebenezer Baptist Church has always been a spiritual home to the "Sweet Auburn" community throughout its existence. Reverend Martin Luther King, Jr. was its most famous member. He was not only baptized in the church, but it is also where he gave his first sermon when he was only nineteen years old. Dr. Martin Luther King, Jr. became a co-pastor of the church in 1960, alongside his father. The Behold Monument was created by Patrick Morelli to commemorate the principles that guided Dr. Martin Luther King, Jr. The sculpture was unveiled by Coretta Scott King in 1990, and serves as a lasting inspiration to those who stand up for social justice, human rights, and dignity. The African ritual of holding up a newborn child and speaking the words "behold the only thing greater than yourself" served as the inspiration behind the monument.